We hope you will be able to join us for our final event before the Museum closes its doors for 2015 : a performance of “Davy the Punk”. 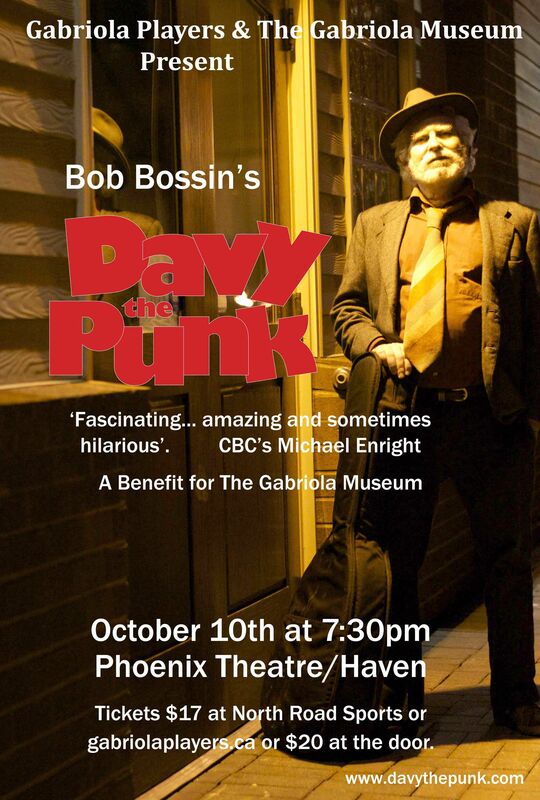 Bob Bossin will be performing his one-man show, probably for the last time on Gabriola, on the evening of Saturday, October 10th, at the Phoenix Theatre at the Haven as a benefit for the Gabriola Historical & Museum Society. In a larger sense, it is also Bob’s gift to the community of Gabriola and takes place, appropriately enough, during the Gabriola Arts Council’s Thanksgiving Studio Tour and is presented in partnership with Gabriola Players. The funds raised will enable the Museum to continue to provide innovative programming within our community and to continue to tell compelling Gabriola stories. The Gabriola Historical and Museum Society gratefully acknowledges the generosity and community spirit of Bob Bossin. We hope to see you on October 10th at 7.30pm at the Haven. Tickets are $17 in advance at North Road Sports and online at www.gabriolaplayers.ca <http://www.gabriolaplayers.ca> or $20 at the door.